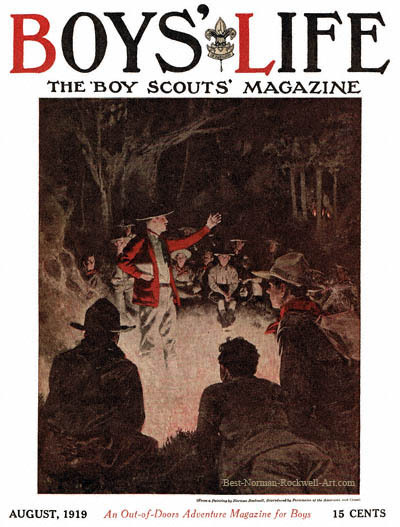 Straight Talks From the Scoutmaster, this Norman Rockwell painting, appeared on the cover of Boys' Life published August 1919. An alternate title for this painting is Scouts Around Campfire. This event marked Rockwell's thirteenth cover publication for Boys' Life. This painting was originally published as part of an article in the November 1918 Red Cross magazine. That article featured three other Rockwell paintings. All of the paintings were Boy Scout related. Rockwell had served as the art director of Boys' Life from 1913 to 1916. But by 1919, Rockwell was already one of America's most notable illustrators. Thus Boy's Life had to reprint paintings already published in order to have Rockwell on its cover. This painting is one of four Norman Rockwell paintings commissioned by the Red Cross magazine illustrating an article written about Boy Scouts. The Red Cross were commending the Boy Scouts on their fine work on the American home front during World War One. This particular painting lets us look in on the Boy Scout camp out. The camp out helps Scouts to enjoy the fellowship of like-minded boys. It also induces confidence in the individual Scout's outdoor and wilderness abilities. We can see the campfire illuminating the campsite. Boy Scouts are all gathered aroung the fire. Now it's time to listen to the Scoutmaster, the leader of the camp. We can also see another campfire in the background. No doubt another Scoutmaster is conducting another "straight talk" to another group of Boy Scouts.